Since contradictory results have been reported, we reanalysed the 77C→G transition in exon 4 of the protein-tyrosine phosphatase receptor-type C (PTPRC also known as CD45) in a large cohort of German MS patients and controls. Different isoforms of the protein are expressed, depending on alternative splicing of exons 4 (CD45RA), 5 (CD45RB) and 6 (CD45RC) (CD45RO, exons 4–6 spliced out). The 77C→G transition does not change the amino acid sequence, but it is probably part of a motif necessary for splicing leading to the isoform CD45RA. The expression of CD45RA is increased in 77C/G heterozygous individuals. The aim of the study was to clarify the importance of the PTPRC 77C→G transition in our German cohort of MS patients. 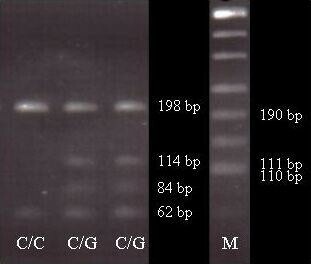 PCR products of exon 4 were digested using endonuclease MspI. The resulting restriction fragments of the wildtype C allele are 198 and 62 bp in length. In the G allele an additional restriction site is present yielding fragments of 114 and 84 bp. The G allele was identified in 10 of the 347 controls (1.4%) and in 7 of 454 MS patients (0.8%; Table 1). No homozygous individuals were found either in the control or in the patient group. Genetic association between the PTPRC 77C→G transition and MS susceptibility was excluded in the MS cohort. In addition, subgrouping patients according to differences in the clinical course of MS or according to HLA-DRB1*15 status did not yield significant differences. The 77C→G transition in exon 4 of the PTPRC gene may contribute to MS susceptibility only in very few families, if at all, but it is not relevant for the majority of MS cases, including virtually all German patients. Multiple sclerosis (MS) is an autoimmune disease affecting the central nervous system by demyelination. Both environmental and genetic components contribute to the development of MS. An efficient strategy to elucidate the genetic background of MS is to analyse single nucleotide polymorphisms (SNPs) in respective candidate genes. Since contradictory results have been reported recently [1–3], we analysed the 77C→G transition in exon 4 of the protein-tyrosine phosphatase receptor-type C (PTPRC also known as CD45) . PTPRC is localized on chromosome 1q31-q32 and consists of 35 exons. The gene encodes a 180–220 kDa glycoprotein expressed on leukocytes and hematopoietic progenitors . This receptor is involved in T and B cell activation and in signal transduction by regulating protein-tyrosine kinases. Because of this involvement in immunological reactions, the gene is a candidate for MS predisposition. The protein exists in multiple isoforms, depending on alternative splicing of exons 4 (CD45RA), 5 (CD45RB) and 6 (CD45RC) (CD45RO, exon 4–6 spliced out). The 77C→G transition does not change the amino acid sequence, but it is probably part of a motif necessary for splicing of CD45RA. The expression of CD45RA is increased in 77C/G heterozygous individuals . Allele frequency of the 77C→G transition in PTPRC. Homozygosity was not observed. Peripheral blood samples from more than 400 healthy blood donors were obtained with their informed consent, and provided by the department of transplantation and immunology of the University Hospital Eppendorf (Hamburg, Germany). The mean age of the healthy donors was 39.3 ± 11.47 years. The male/female ratio was 1.4 ± 0.5. More than 800 unrelated MS patients attending the Department of Neurology, University clinics of Bochum and Göttingen (Germany) participated in this study. The male/female ratio was 1.7 ± 0.47, the mean age at MS onset was 29.9 ± 9.63 years. 55.3% of all clinically diagnosed MS patients exhibited a relapsing/remitting course of MS (RRMS), 25.8% developed secondary progressive MS (SPMS) and 18.9% were characterized by primary progressive MS (PPMS). The mean EDSS (expanded disability status scale) of all MS patients was 4.2 ± 2.31, of PPMS 5.8 ± 1.91 and of RRMS+SPMS 3.9 ± 2.25 . Polymerase chain reaction (PCR) of exon 4 of PTPRC was carried out in a final volume of 12.5 μl with 50 ng of DNA, 200 μM dNTP, 1 U Taq Polymerase and PTPRC exon 4 specific primers (forward, 5'-ATTTATTTTGTCCTTCTCCCA-3' and reverse, 5'-GTTAACAACTTTTGTGTGCCAAC-3'). PCR cycling started with initial denaturation for 5 minutes at 94°C. The annealing temperature of the first cycle was 61°C, second cycle 58°C and remaining 26 cycles 55°C. The annealing time was 1 minute. Extension was performed at 72°C for 1 minute (final extension 5 minutes). PCR products were digested using endonuclease MspI according to the manufacturer's recommendation. Digested DNA was electrophoresed on 1.5% agarose gels. The restriction fragments of the wildtype C allele were 198 and 62 bp in length. The G allele harbors an additional restriction site so that the 198 bp fragment is digested into 114 and 84 bp (Figure 1). The rare G allele was present in 10 of the 347 controls (1.4%) and in 7 of 454 MS patients (0.8%; Table 1). There were no homozygous individuals either in the control or patient groups. Genetic association between the PTPRC 77C→G transition and MS susceptibility was excluded in the MS cohort. In addition, subgrouping patients according to differences in the clinical course of MS (RRMS, SPMS, PPMS) or according to HLA-DRB1*15 status did not yield significant differences. This result contradicts the findings of Jacobsen et al. who demonstrated an association of the mutation with MS in 3 families. Barcellos et al. and Vorechovsky et al. excluded MS association as well. However, as yet unknown polymorphisms in the PTPRC gene may contribute to MS susceptibility. In conclusion, the PTPRC exon 4 77C→G transition seems to contribute to MS susceptibility only in a few families, if at all, but it is not relevant for the majority of MS cases, also not in virtually all German patients. We would like to thank the MS patients for participating in this study, Susann Schiwy, Gudrun Rodepeter and Margret Schumacher for excellent technical assistance and Professor David Ballantyne for his expert corrections of the scientific English. This work was supported by BMBF (01GG9841). BM carried out the molecular analyses, ES, MH, and SS examined the MS patients, and JE participated in the study design and the coordination.